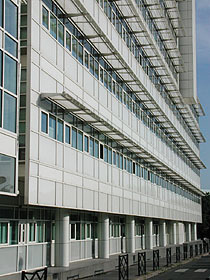 The Canal+ headquarters in Paris is a commercial application of Meier's recipe of all-white paneling, all-white detailing and glass. 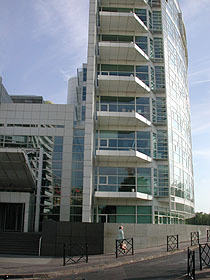 In this case the building houses studio production facilities, in its east wing, and offices, in its west wing with views over the Seine, for the commercial television company Canal+. The result is an attractive commercial building, but not a show destination on a par with Meier's museums (e.g. in Barcelona or Los Angeles) or private homes. Take the metro to Javel (line 10 or RER line C) and walk south down quai André-Citroën; or to Balard (line 8) and walk north up rue Balard. 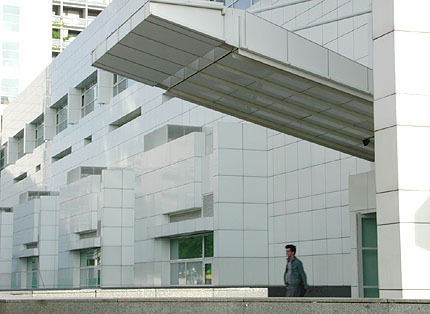 The building is operated by Canal+ (part of Vivendi Universal) and is not open to the public. copyright © galinsky 1998-2010. e-mail info@galinsky.com.